1 in 14" (most common) or 18"
The .458 SOCOM (11.63×40mm) is a moderately large round designed for a specialized upper receiver that can be mounted on any AR-15 pattern lower receiver. The 300-grain (19 g) round offers a supersonic muzzle velocity of 1,900 ft/s (580 m/s) and 2,405 ft⋅lbf (3,261 J), similar to a light .45-70 but with a much smaller case. Prompted by the lack of power offered by the 5.56 NATO cartridge used in the M4 carbine and the M16 rifle, the .458 SOCOM came about from informal discussion of members of the special operations command, specifically Task Force Ranger's experience that multiple shots were required to incapacitate members of the opposing force in Mogadishu during Operation Gothic Serpent. The reason being many Somalis would chew the drug Khat all day and the effects of the drug would both curb their appetite (a country plagued by famine) and allow them not to feel pain. Marty ter Weeme of Teppo Jutsu designed the cartridge in 2000 and Tony Rumore of Tromix was contracted to build the first .458 SOCOM rifle in February 2001. SOCOM is the acronym for the Special Operations COMmand. The project sponsor set forth a number of specific requirements namely that the cartridge had to fit in the M4 carbine and be capable of firing heavy-for-caliber projectiles at subsonic velocity using suppressors. During the development phase, various other cartridges were considered and proposed to the project sponsor, but rejected as not meeting all the requirements. The cartridges considered were 7.62×39mm, 9×39mm Grom, .45 Professional (which has since become the .450 Bushmaster), and .50 Action Express. At the time, the .499 LWR cartridge was still in development phase and had not been chambered commercially. The .45 Professional was ruled out because, in an interview with industry press, the developer of said cartridge stated that steel proprietary to General Motors was used in the bolts and extensions to withstand the high operating pressures. The .50 AE and .499 LWR were ruled out because in 2000 only two bullets were offered in .501 diameter, both developed as pistol bullets for the .50 AE and not heavy enough for the subsonic suppressed role. Research had indicated that a short belted cartridge called the .458 × 1.5" Barnes had been adopted for use in suppressed bolt-action rifles for use in SE Asia during the Vietnam War. It was shown as effective in terms of ballistics, firing a 500 grain bullet subsonically, but not ideally suited for its role due to the size and weight of the platform. Combined with the wide selection of bullets available in .458 diameter, this cemented the choice of caliber. The cartridge case design was finalized based on discussions with Tony Rumore at Tromix suggesting a lengthened .50 AE case would work well in the magazines as well as be the largest diameter case to be able to feed through the barrel extension. The initial prototype brass still bore the .50 AE head stamp and this has caused some confusion, as the SOCOM case is longer with a narrower rim. The .50 AE rim diameter was reduced from .514 inch to .473 inch for compatibility with other platforms, primarily bolt-action rifles. The .473-inch/12mm-diameter rim was designed in 1888 for the German Commission Rifle chambered in 7.92×57mm Mauser cartridge, and is arguably the most common rim size globally, as all bolt actions chambered in cartridges derived from that shell, such as .30-06 Springfield, .308 Winchester or cartridges derived from them share this rim size. The case length was chosen to be compatible with the Barnes 300-grain X Spitzer bullet. The final case design has base and rim dimensions identical to the .425 Westley Richards, although making .458 SOCOM cases from it is impractical due to the high cost of .425 brass. In 2009, Barnes developed a new bullet specifically for use in the .458 SOCOM, the 300 grain Tipped Triple Shock X, also known as the TTSX or TAC-X. As noted above, the cartridge was designed to be 100% compatible with the M4 platform. This included the buffer, buffer spring, NATO magazines, many aftermarket .223/5.56 magazines, and magazine well. In .223/5.56 caliber, cartridges stack in a staggered (double stack) fashion. However, with the much larger .458 SOCOM, rounds "single stack" without any modification to the standard GI magazine feed lips or follower. A standard 20-round 5.56mm NATO magazine can hold seven .458 SOCOM rounds and a standard 30-round 5.56mm NATO magazine can hold ten .458 SOCOM rounds. 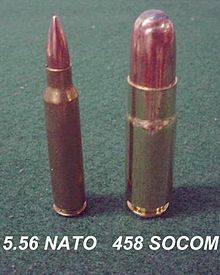 ^ "Teppo Jutsu 458 SOCOM FAQ"
The website dedicated to the .458SOCOM, where load data and other info also available.